The 37100C series microwave vector network analyzers are configured as direct-access receivers for antenna, frequency conversion, and multiple output device measurements. The 37100C offers ultimate flexibility to meet most receiver measurement needs while maintaining the ability to measure all four S-parameters with the addition of a reflectometer setup at the front end of the receiver. 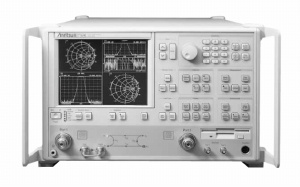 The 37100C series offers two wide-band microwave models covering the 22.5 MHz to 20 GHz or 40 GHz ranges.